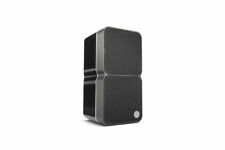 Cambridge Audio Minx Min 12 Speaker (Black) - Refurbished. The Minx series redefines what’s possible from speakers this size. Each unit is discrete in both stature and design, yet they all produce a huge sound normally only associated with much larger, traditional box speakers. Make: Cambridge Audio. 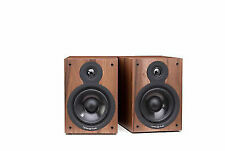 This is a Sale for a Pair of Pulsating Tested together on site and they produce amazing sound! We promise to resolve your concerns quickly and professionally. Proceeds are used to support local programs and services. This is a refurbished previously owned and loved Cambridge product which has been expertly repaired. At Cambridge Audio we stand behind the quality of our goods. However, all functions work to specifications. BOOKSHELF SPEAKERS. This is a refurbished previously owned and loved Cambridge product which has been expertly repaired. Black or walnut. The SX-50 is designed to sound truly stunning, at a price that’s unrivalled. With 120W of balanced power, TVB2 has been engineered for deep punchy bass and a detailed midrange and crisp treble. TVB2 also has an optical digital input and an AUX-in analogue input, so literally any TV or source can be connected. Cambridge Audio S212-V2 Minx 2.1 Speaker System (Black). 2-1/4" BMR woofer (each). 6-1/2" front-firing woofer and dual 6-1/2" passive radiators. Subwoofer has light scratches on top. 600D Tabletop Speaker Stands. And with two mid base drivers incorporated into the Aeromax 6 the bass is ground shaking. Using the BMR shifts the crossover point between tweeter and woofer away from the usual 3kHz, right at the middle of the human ear's most sensitive hearing range, to a less problematic 250Hz. It's just undergone an upgrade for 2017 but TV5 still promises nothing but simplicity. If you're looking for a speaker to sit your TV directly on top of - the TV5 will support any with up to a 30kg weight and 725mm base. You are buying aNEWCambridge Audio TV2 (V2) Soundbase with Bluetooth (Black) - NEW Shelf. Cambridge Audio TV2 (V2) Soundbase with Bluetooth (Black) - Refurbished. Soundbase with Bluetooth. This is a refurbished previously owned and loved Cambridge product which has been expertly repaired. CAMBRIDGE AUDIO WS30 SLIMLINE WALL MOUNT SPEAKERS. In line with Cambridge Audio’s legendary sound-first approach, the WS30 is brimming with audiophile-grade components and materials for sensational music performance. It has never been used and it was sent directly from Cambridge Audio. When it was sent from the manufacturer the box wasn't sealed, so I thought I would take a picture of the inside. 2.25" Long-Throw Woofer. 2-Way Speaker Design. 2.25" Balanced Mode Radiator Driver. Using the BMR shifts the crossover point between tweeter and woofer away from the usual 3kHz, right at the middle of the human ear's most sensitive hearing range, to a less problematic 250Hz. You can place the Aeromax 2 wherever you want and still get great stereo and surround effects. No matter what you're streaming, youll be sure to hear every single detail from all your favorite music. Stereo system each speaker with a full range driver and subwoofer. There’s no disguising that (M) was made by Hi-Fi engineers. Yes, a one box speaker is practical and space efficient, but from a sound perspective this is a compromise. TVB2 also has an optical digital input and an AUX-in analogue input, so literally any TV or source can be connected. The unique BMR speaker drivers in the TVB2 sound bar provide wide frequency ranges and disperse your audio in 180° of sound waves. Cambridge Audio G5 | Champagne Bluetooth Portable Speaker. The G5 is our best bluetooth speaker yet. Exceptional sound quality, more features than anyone else at this price and a stunning slim line design, which looks great anywhere. This is a refurbished previously owned and loved Cambridge product which has been expertly repaired. Wireless Bluetooth Speaker & Radio. AptX Bluetooth with Near Field Communication (NFC) pairing, 3.5mm aux, USB charging port, FM radio. Two full range drivers, subwoofer and passive bass radiator. This is a refurbished previously owned and loved Cambridge product which has been expertly repaired. Portable Bluetooth Speaker. (S) stands for small and from the outside, that is exactly what this speaker is. Brand new in original packaging-a pair of Cambridge Audio Aero 3 surround sound speakers in dark walnut. Free shipping offered! "Do judge a speaker by its cover. The Yoyo (L) is drop dead gorgeous.". - The Poor Audiophile, September 2018. This is a refurbished previously owned and loved Cambridge product which has been expertly repaired. Speakers usually have a separate tweeter and a mid/bass driver. The Aeromax 2 speakers are optimised for this job and expand on the radical design found in the award winning Aero speaker range. But don't just take our word for it - listen to a pair, we think you'll be amazed! The Bluetone 100 is a powerful Bluetooth speaker which connects to almost any device for a breathtakingly big sound. This is a refurbished previously owned and loved Cambridge product which has been expertly repaired. This speaker is in Excellent Condition and works and sounds INCREDIBLE! All the drivers are in perfect working condition, no dents or holes no buzzing or scraping they have rubber surrounds so no foam rot. The Minx S212 system was designed for hi-fi sound on a low-fi budget, and will instantly fill your room with a tonal quality that has to be heard to be believed. Whether you're looking to maximize your music or movie experience or add depth to your favorite TV shows and sports, the Minx S212 is waiting to show you what you've been missing. OCCASIONALLY, WE MAKE A MISTAKE. TWO STARS IS WELL WORN, BUT WE THINK IT WORKS. FOUR STARS IS LIKE NEW OR IN EXCELLENT CONDITION. ITEM IS NEW AND UNUSED. ONE STAR IS WORN OUT REQUIRING REBUILD OR HEAVY REPAIR. Cambridge Audio G2 Mini Portable Bluetooth Speaker (Gold) - Refurbished. An ultra-compact Bluetooth speaker with big sound and big battery. It’s the best little speaker around. Mini Portable Bluetooth Speaker. Includes the two bookshelf speakers, speaker grilles as well as users/installation guide. Don’t miss out on this opportunity! 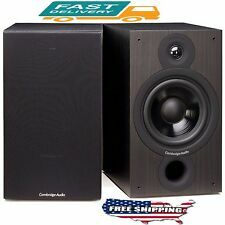 Cambridge Audio SX-50 Bookshelf Speakers Pair with 2-Way Crossover (BLACK). Condition is Newly refurbished from Cambridge factory. ABOUT THE CAMBRIDGE SX-50. The SX-50's solidly braced MDF cabinets are computer-designed to help minimize standing waves and prevent unwanted resonance from coloring the sound. CAMBRIDGE TVB2 120watt Soundbar with Wireless Sub/4k-3D-HDMI/remote $500 list ! Auto power on and off kicks in when TVB2 isn’t needed and when you’re ready to go, the system reboots almost instantly. The result is the Cambridge Audio TVB2; a soundbar and wireless subwoofer capable of extracting massive detail from all your music and movies and the ultimate upgrade for your 4k or standard TV. This is a refurbished previously owned and loved Cambridge product which has been expertly repaired. Wireless Bluetooth Speaker. AptX Bluetooth with Near Field Communication (NFC) pairing ,3.5mm aux ,USB charging port. The G5 is our best bluetooth speaker yet. Exceptional sound quality, more features than anyone else at this price and a stunning slim line design, which looks great anywhere. With G5 you can take your music anywhere without having to compromise on sound quality.Features. An ultra-compact Bluetooth speaker with big sound and big battery. It’s the best little speaker around. Mini Portable Bluetooth Speaker. This is a refurbished previously owned and loved Cambridge product which has been expertly repaired. Cambridge Audio G2 Mini Portable Bluetooth Speaker (Red) - Refurbished. An ultra-compact Bluetooth speaker with big sound and big battery. It’s the best little speaker around. Mini Portable Bluetooth Speaker.